How does Java knows to throw ConcurrentModificationExeption? It uses a transient variable called modCount, which keeps track of how many times a list is modified structurally. Structural modifications are those that change the size of the list, which may affect the progress of iteration and may yield incorrect results. Both Iterator and ListIterator uses this field to detect unexpected change. Other methods of List which structurally modify List also uses this method e.g. add(), remove(). Problem: loop over an ArrayList and remove selected elements, but remove() is throwing "Exception in thread "main" java.util.ConcurrentModificationException". Cause: The real cause of ConcurrentModfiicationException is inconsistent modCount. When you are iterating over ArrayList then Iterator's next() method keep track of modCount. If you modify the collection by adding or removing element then modCount will change and it will not match with the expected modCount, hence Iterator will throw ConcurrentModificationException. Solution: Use Iterator if you are doing it on the single threaded environment, otherwise use concurrent collection classes e.g. CopyOnWriteArrayList to remove elements while you are looping over it. Here is the Java program to demonstrate one scenario where you get the ConcurrentModificationException even if just one thread is modifying the ArrayList. In this example, we are looping over ArrayList using advanced for loop and removing selected elements, but because we are using ArrayList's remove() method. * one thread is modifying the collection e.g. List. * while iterating over it e.g. adding new element or removing elements. * method() to avoid ConcurrentModificationExcetpion. because we are using ArrayList's remove() method. 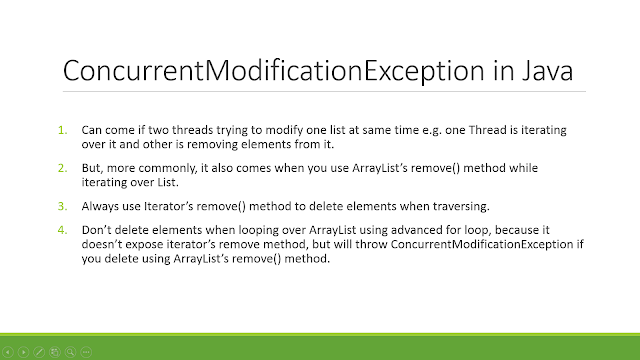 In the second example, we have used remove() method of Iterator and that's why we are successfully able to delete selected elements from the ArrayList without ConcurrentModificationException. That's all about how to deal with ConcurrentModificationException in Java. The biggest thing to learn and remember is that this error can come even if you have just one thread modifying collection e.g. removing elements while looping over the list.